I used to think of cabbage as a winter food. It is of course a "storage vegetable" (it keeps well...and for a long period of time). But my thinking probably had more to do with the fact that I didn't really add cabbage to my diet until I started enjoying Colcannon Potatoes every year for St. Patrick's Day. It is always abundant in the stores at that time (more for cabbage and corned beef than for Colcannon I suspect...). And since I am part of a household of just two, there is always a lot of cabbage left from the head I purchase for our Irish feast. For a couple of weeks after St. Patrick's Day we always enjoy it in various forms—soups, pastas, winter slaws, warm salads and etc. I'm not sure why I don't purchase it more often...it really is quite versatile. big firm green/white and red cabbages...as well as Savoy. This month a cookbook group that I am a part of on Facebook is cooking through recipes from the Ottolenghi cookbooks. I haven't had much time this month to try new things in the kitchen, but I took the time to try a raw cabbage salad from the book Plenty. I noticed the salad because it included not only cabbage (which I happened to have), but also all kinds of things that are available at my farmers' market right now (kohlrabi, alfalfa shoots, dill). It was very good...tangy and refreshing on a hot day. With the exception of one minor tweak, I made the recipe exactly as written. Because I didn't really change it, I wasn't going to post it. 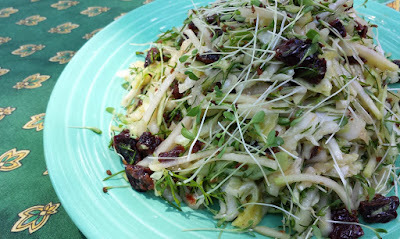 But then I considered the fact that it includes kohlrabi...and I changed my mind. If you have been wondering what to do with that kohlrabi that appeared in your CSA share, you should definitely give this salad a try. 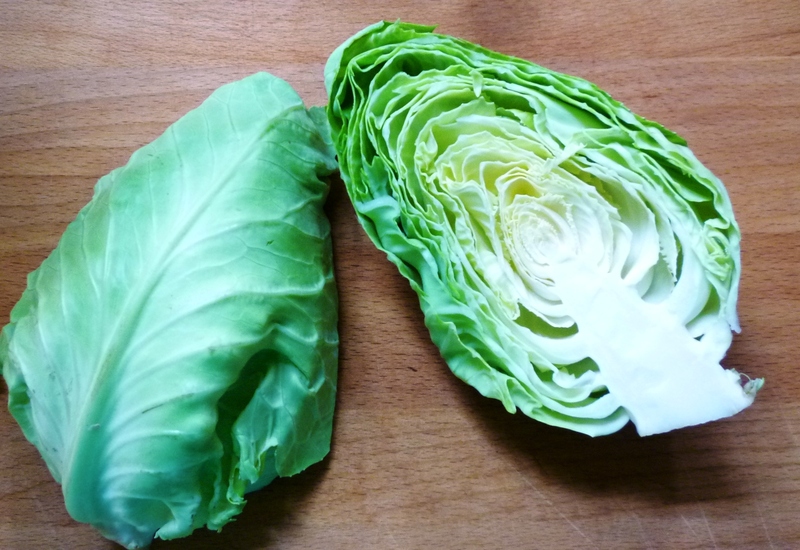 In its cooked form, cabbage is good in the aforementioned stews and quick sautés. But I think I like it best lightly cooked in a slight film of buttered, simmering water. When cooked in this manner it is soft and tender...but not mushy at all. Furthermore, it cooks quickly so it doesn't take on the strong "cabbage-y" aroma of long boiled cabbage. It is in fact mild and sweet when treated this way. 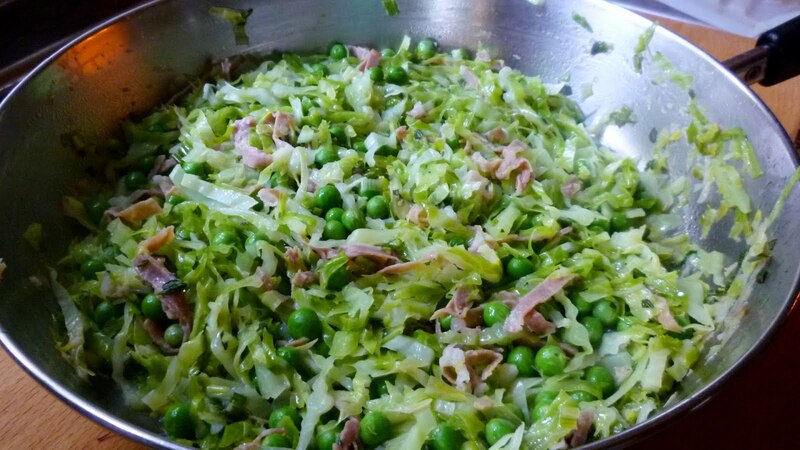 Recently I added a few fresh peas to my cabbage as it cooked...along with some prosciutto and fresh herbs. 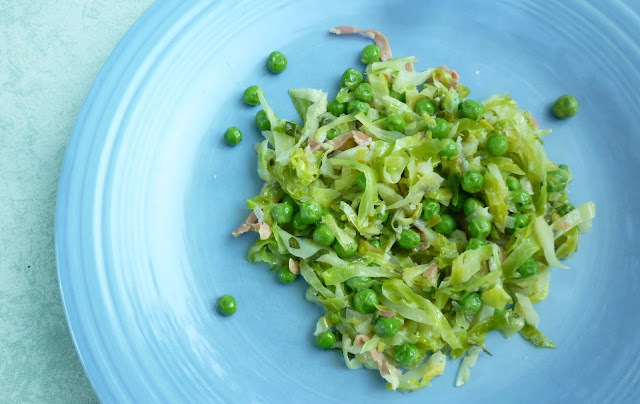 Cured pork...in the form of bacon and air-cured hams...is a traditional accompaniment to both cabbage and peas. Combining them all in the same pan seemed like a no-brainer. 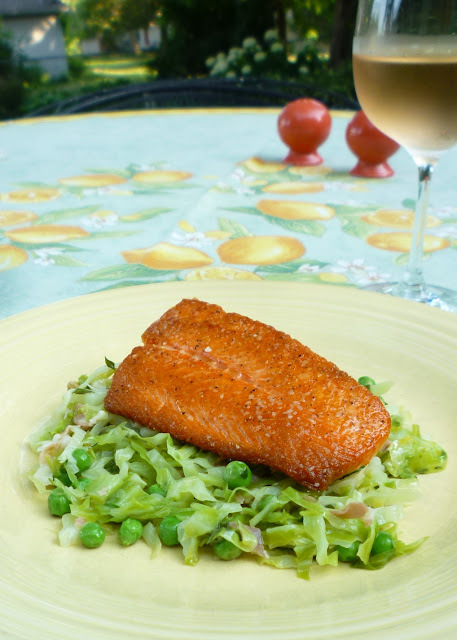 Served with some fresh, wild sock-eye salmon that happens to be in season at the same time as the cabbage and peas, it made a simple, subtle and utterly delicious early summer meal. Sadly, where I live, peas are going out of season...but hopefully you have been able to freeze a few. If not, fresh corn, cut from the cob, would make a delicious substitute. Cabbage is definitely summer food. Halve the cabbage through the core. Cut into manageable wedges (about 1 1/2- to 2-inches wide) to yield the weight that you need. Return the remainder to the fridge for another use. Cut the cores out of the wedges. Slice the wedges cross-wise into 1/4-inch ribbons. You should have about 200g/7 oz. of sliced cabbage. Set aside. Melt a tablespoon of the butter in a medium-sized wide sauté pan (with a lid) set over medium heat. Add the spring onion along with a pinch of salt and cook 'til tender...about 5 minutes. Add another 1/2 to 1 tablespoon of butter along with the herbs and a couple tablespoons of water and increase the heat slightly. When the butter is melted and the water is simmering, add the cabbage with a pinch of salt and toss to coat in the butter and onions. Cover the pan, reduce the heat, and simmer gently until the cabbage is tender but still has texture—maybe 4 or 5 minutes. Add the peas (if using fresh), prosciutto and zest. If the pan is dry, add a splash of water. Cover and continue and simmer until the peas and cabbage are tender (but not mushy)...another 2 to 5 minutes. 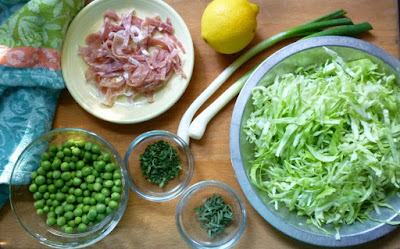 If using frozen peas, wait to add until the cabbage is tender (adding the prosciutto and zest when the cabbage is half cooked). This recipe is easily multiplied; simply increase the size of your sauté pan as necessary so that it will accommodate the cabbage when covered. 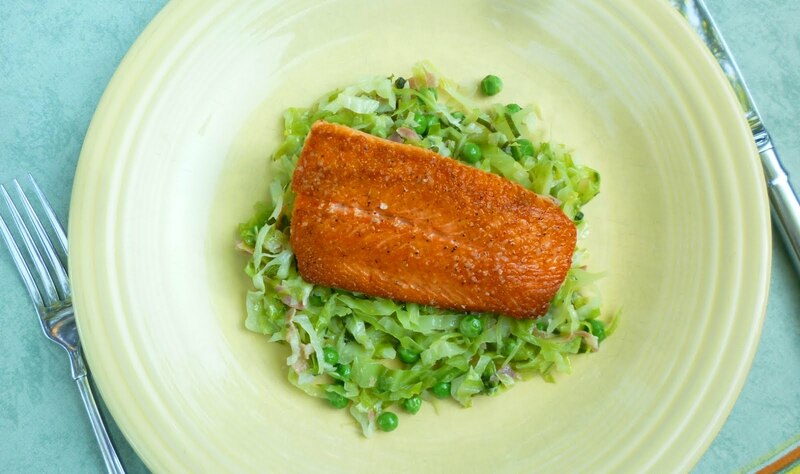 This is delicious with pan-seared wild salmon. Heat a sauté pan (large enough to comfortably hold all of the fish) over medium-high heat. While the pan is heating, season the fish on both sides with salt & pepper. Add a thin film of oil to the pan. When the oil is very hot, add the fish, skinned side up ("service side" down). Cook until golden brown and crisp—about 2 to 3 minutes, regulating the heat as necessary to prevent smoking but at the same time, maintaining an active sizzle. Turn and cook the fish (either on the stove or transferring to the oven), until barely opaque in the center—another 3 to 5 minutes, depending on the thickness of the filets. Give the filets a generous squeeze of lemon juice and serve. I noticed when I linked to my post of Suzanne Goin's Cabbage with Corn and Bacon recipe that these two recipes are actually quite similar. Clearly I have absorbed her recipe into my cooking psyche! I think of this one as a softer, gentler version....and I love the all green flecked with pink...set off and echoed by the pink salmon. Peel the kohlrabi and cut into thick matchsticks that are about 1/4 inch wide and 2 inches long. Cut the cabbage into 1/4-inch-thick strips. Using a microplane zester, grate the garlic clove into the lemon juice and let sit for five minutes or so. Put the cabbage, kohlrabi and lemon juice with garlic, along with all the remaining ingredients except the alfalfa sprouts, in a large mixing bowl. Using your hands, massage everything together for about a minute so the flavors mix and the lemon can soften the cabbage and cherries. Let the salad sit for about 10 minutes. Use your hands again to lift the salad out of the mixing bowl and into a serving bowl, leaving most of the juices behind. 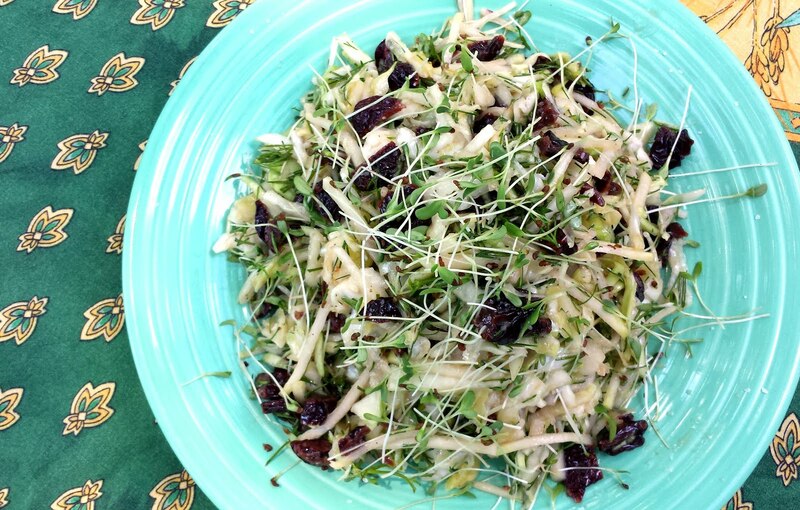 Garnish with the remaining sprouts and serve at once. Serves 4 to 6.